The Obama Administration appears to be preparing to leave American Pastor Saeed Abedini and the other U.S. citizens wrongfully imprisoned in Iran on the sidelines of the Iran nuclear negotiations - even promising a veto to congressional legislation if an amendment is added to include the imprisoned Americans..
That is simply unbelievable. Refusing to discuss the Americans being held hostage by Iran at the bargaining table and rejecting any congressional attempt to make any deal with Iran contingent on the release of the Americans is unacceptable. It’s quite frankly appalling. JONATHAN KARL, ABC NEWS: The Senate of course is debating the Corker Bill. Corker announces he has a veto proof majority. He doesn't really need it, because you’ve endorsed the compromise bill. But there are a whole series of amendments that are going to be voted on. You know, for instance, there’s an amendment that says before any sanctions are lifted, Iran would have to release those three Americans known to be in Iranian prisons. What is the administration’s view on these amendments? Are you saying it is this deal or no deal? Would we go back to a veto threat situation if, in the specific instance I just mentioned, an amendment passes that says first Iran needs to release those Americans? Would you veto that bill? 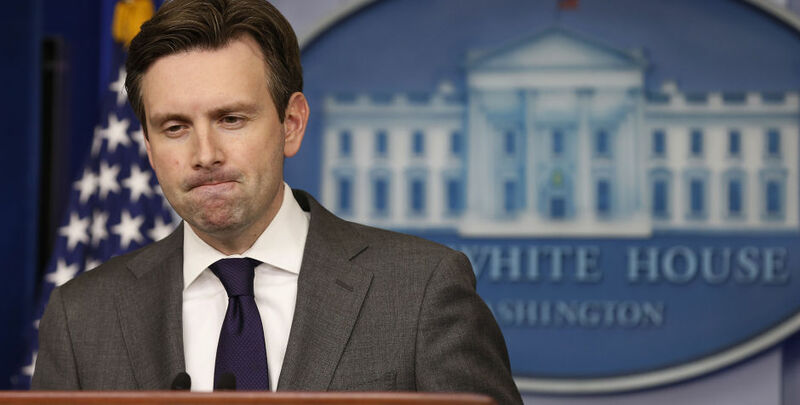 JOSH EARNEST: The President would certainly veto any amendment or any bill with an amendment that undermined the unanimous compromise that was reached in the Senate Foreign Relations Committee or that interfered with the ongoing negotiations. Certainly a provision, an amendment, that made this nuclear deal contingent on Iran’s release of those three American citizens would fall, I think frankly, into both categories. It would directly undermine the unanimous compromise that was reached in the Senate Foreign Relations Committee, and it certainly would interfere with the ongoing negotiations between the international community and Iran on their nuclear program. KARL: So the President would veto that? EARNEST: So, those kinds of amendments that are added to the bill, that undermine the unanimous compromise or would interfere with the talks would earn a presidential veto. And I think that, given, again, the unanimous vote in the Senate Foreign Relations Committee, I am confident there would be strong support—or I guess strong opposition—to those kinds of amendments. And that opposition, I would expect it to be bipartisan. But this is a process that will have to play out. This is despicable. This is outrageous. And it is an insult to the captive Americans and their families. The President is promising to veto a bill requiring the release of Pastor Saeed and the other Americans imprisoned in Iran. Time is running out. We must put more pressure on the White House and Congress. The fact of the matter is simple. There can be no deal unless Pastor Saeed and his fellow American hostages in Iran are free. The Senate is debating key amendments that prioritize the release of American Pastor Saeed Abedini to reunite him with his family here in the U.S., along with the release of the three other American hostages, Jason Rezaian, Amir Hekmati, and Robert Levinson. We are fighting on Capitol Hill and working directly with members of the U.S. Senate. Over 185,000 of you have already signed our latest petition to urge the U.S. Senate to do the right thing. Stand with us as we urge Congress to legally require Pastor Saeed’s freedom before any deal with Iran is finalized. We're taking direct action for Pastor Saeed and the persecuted Church. Join us with your tax-deductible gift today. Have your gift doubled through our Matching Challenge.